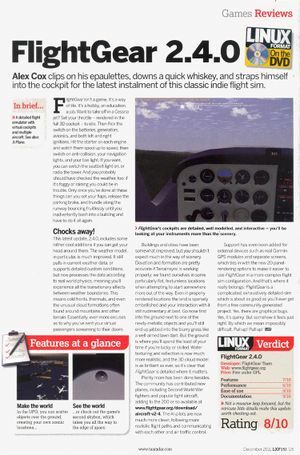 We would like to emphasize that the monthly newsletter can not live without the contributions of FlightGear users and developers. Everyone with a wiki account (free to register) can edit the newsletter and every contribution is welcome. 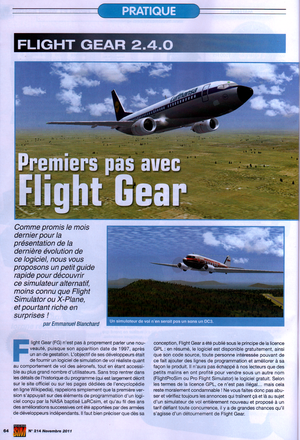 So if you know about any FlightGear related projects such as for example updated scenery or aircraft, please do feel invited to add such news to the newsletter. This newsletter contains some very important information for contributors, so read it carefully! See Release plan for the main article about this subject. On December 17, our Git repository will be declared "frozen". This means that no new features or major changes shall be pushed onto the development streams (neither source nor data). This period is for preparing the code for the release and make sure there are no major issues. It lasts for four weeks until creation of the release branches. Contrary to the last release cycle, aircraft in fgdata may be handled as an exception from the frozen state. Any change to aircraft may be pushed to the repository if it is guaranteed that this change does not affect any other aircraft or system and if no file outside the root directory of that specific aircraft is changed. Aircraft defined as part of the base package (e.g. the c172p) enter the frozen state and shall not undergo major changes in that period. Keep in mind that the people that are able to commit your stuff are just as busy finishing their own work as you are! Therefore it is important that you create merge requests for everything that you'd like to see included in the upcoming release, as soon as possible. This includes new aircraft and large updates to existing aircraft. Don't let it wait for tomorrow, do it today! 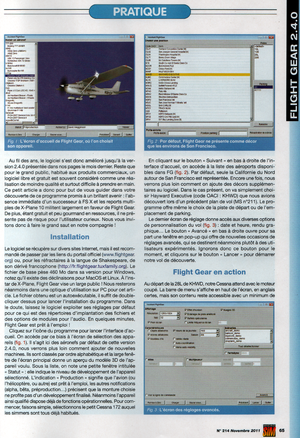 See FlightGear Git: splitting fgdata for the main article about this subject. After much discussion on the mailing list, it was decided to put the existing attempt to split fgdata on hold until further notice. The main reason for postponing the split was that, while it was considered a well intended initiative, the end result of the splitting process itself left the FlightGear fgdata project in a less than desirable state. For this reason, before another splitting attempt is to be undertaken, the pro's and con's of each step should be carefully evaluated. The split article has been updated to discuss some of our options and formulate a plan of approach that can be presented to -and discussed in further depth- on the developers mailing list. Those of you that started using the flightgear-aircraft/* repositories on Gitorious, make sure to commit your updates to fgdata, or create a merge request. The FlightGear Aircraft project will not be used for the FlightGear 2.6.0 release and will likely be re-created when we reach that step in the split-plan. Emilian and Vivian have been very busy over the last months updating and improving our shaders. 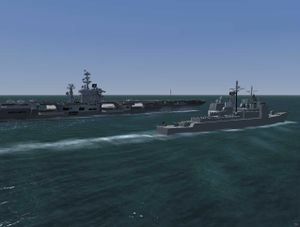 The plan is to rationalize some into one "aircraft" shader, to use just one method of computing fog, and to improve the appearance of the sea by adding foam and aligning the waves with the surface wind. Along the way the appearance of wakes was improved. There is still much to be done, but the work should start to be uploaded to git soon. It's not without cost to the frame rate, so you will need a pretty powerful video card to run all the features at the same time with the slider set to high quality: nVidia GTX 260, or the ATI equivalent is probably the minimum. By selecting a lower quality vs performance slider setting the old shaders will still be available. Since the previous edition, we try to have a monthly interview with a contributor. Questions are available on interview questions and anyone is free to write an interview (with him-/herself) for next month's newsletter! I've been contributing for the last 5 or so years, and was using it before that. I dip in and out of lots of things. I've spent a lot of time in the last couple of years working on the 3D clouds, and before that random vegetation. I've created a couple of aircraft (vulcanb2, flash2a, pittss1c), and maintain a couple more (c172p, a4f, Cub). I also help maintain The Manual. I'm one of the moderators on the forums, and I sometimes remember to write something for the Newsletter. Trying to get more performance out of the 3D clouds! I'm also looking at improving the HTML output of The Manual, so it's easier to use online. Absolutely. FG has never been healthier. With all the hard work people like James Turner and others have put into our Jenkins build server we're now able to produce releases every 6 months. That's a massive step forward from even two years ago. The range and quality of aircraft in the hangar continues to increase, and Martin's continual work on improving our scenery infrastructure will pay huge dividends in the future. I also think people get used to new features very quickly, so they effectively disappear. When I created the first proper forests (with a lot of help from Tim Moore), it was pretty exciting as we'd never been able to have that density of foliage before. Nowadays we all take it for granted. Start small. Modify an existing aircraft rather than create a new one from scratch. It's tempting to start something new, but the amount of time and effort required to actually create a worthwhile aircraft with any realism is huge. We stand on the shoulders of giants in FG, so you might as well take advantage as much as possible! The FlightGear livery database is re-opened for contributions! Due to some problems in the uploadscript no submissions were accepted for several weeks. The uploadform has been redesigned, to allow quicker and easier processing of livery packages. Comments and ideas are highly appreciated. And so are liveries of course, at this link! At the same time, the airlines page received a new "paging", based on first letter of the airlines. This allows you to find what you're looking for in an instant. Scenery buckets of FG mapserver. 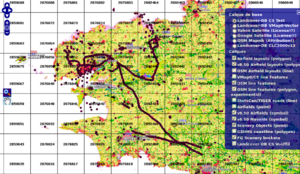 As of November 20th, there are 1,122,603 objects positions known in FlightGear's scenery database. It is now possible to show on FG scenery map the scenery buckets. This may be useful for our fellow contributors. Thanks to Martin, Tuxklok and Elmaxo for this nice and useful update. Never seen FG's scenery mapserver? Click here to see how it looks like and play with the different layers to the upper right. Enjoy! More amazing flights can be found at Suggested Flights. Now that aircraft can be rated (on completeness/status), it made sense to put these aircraft into categories, based on their status. A small adjustment to the aircraft infobox made this process completely automated. All you, as wiki-aircraft-article author need to do is add the ratings to the infobox. All status categories can be found under Category:Aircraft by status. "A picture is worth a thousand words", as they say. Yet, lots of wiki articles lack (sufficient) imagery. To get you going, a special category has been created, which lists articles that are in desperate need for images. Click the thumbnail to go to the image's page. Click the "Upload a new version of this file" link, located underneath the image. This brings you to the usual upload form. Browse to the new image and click the upload button. You'll get asked whether you really want to overwrite an existing file. Say yes. Don't worry if you make a mistake, the wiki moderators can retrieve overwritten files easily. Refresh your browser (F5), to show the new image. Proudly presenting FlightGear, from left to right: Gijs, Lindsay, Jorg, Mathias, Durk, ThorstenB, TorstenD, Martin, and Hans. This month, on November 5, and 6 the worlds’ largest annual FlightSimulator event was organized again at the Aviodrome aviation museum at Lelystad Airport, the Netherlands. Continuing our tradition, FlightGear had a strong representation, demonstrating the latest features of the upcoming FlightGear 2.6 release. During the 2-day event, we showed the latest experimental scenery developments, Thorsten Rennk's local weather system, an early release of the wonderful DC-3 from the FlightGear france development team, as well as many other goodies. Continuing our development from last year, we now had a fully working high-end computer, provided by Thomas-Krenn computing, that was running flightgear on no less than 10 monitors and 24 CPU-cores. In addition to presenting FlightGear on our booth, one of our team members, Durk Talsma, was also given a one hour slot to present the history of the FlightGear project, as well as it’s current state-of-the-art to a small but interested audience. As always, it’s nice to talk to the many visitors at our booth, and every year we begin to notice more recognition from the audience. As a consequence the team has gotten a number of invitations to present FlightGear among Flight Simulator clubs in the Netherlands and Belgium. 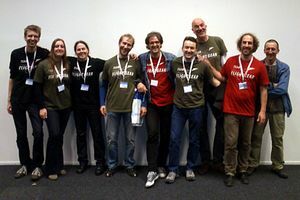 The fact that FSweekend is a great place to meet people was again exemplified by the fact that we met FlightGear contributer David Van Mosselbeen, who had traveled from Belgium to catch up with the team. But perhaps the greatest surprise of the weekend was the fact that our team was met by a DC3 captain, who offered us a discount on a flight with the real DC-3, the PH-PBA (FlightGear livery), formerly owned by his royal highness, prince Bernhard of the Netherlands, and once the first official aircraft of the Dutch government. Details of the plan are currently being worked out, so stay tuned for a short update once we have flown. A video, shot by a visitor, featuring our 10 screen procedure trainer setup. Various pictures of FSweekend exhibitors (including two of our booth, all the way at the end). A video on draoi99's Youtube channel showing some scenes of various aircraft flying in coastal areas. The video has a "weather forecast" theme and a new feature in development - white wave tips in stormy weather - can be seen. Since this month, FlightGear is also active on Google+! Another way to reach users and promote FlightGear. Completed Cessna C172P Mini Cockpit using FGPanel. FGPanel, the new FlightGear utility to drive cockpit instrument panels like the PMPT, has been used in another cockpit project: the C172p Mini Cockpit by ThorstenB. 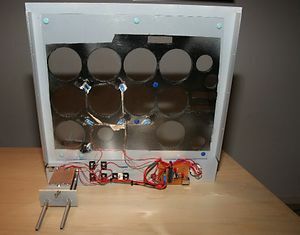 The project used the "standard" ATMEL USB HID controller, a second-hand TFT (13€), a piece of wood, some paint - and lots of buttons and switches. The project literally finished the night before FSWeekend - ready to be added as another exhibit at the FlightGear booth. More photos documenting the making of the C172p Mini Cockpit are available here. 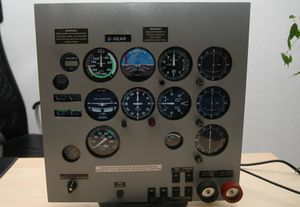 As a byproduct of the C172p Mini Cockpit, a FGPanel Live System is available now. The Live System is a complete, stand-alone software setup, including FGPanel, (partial) FGData, Linux operating system and necessary start-up scripts. The ISO image (350MB download) needs to be programmed on a CD/DVD, USB flash or hard disk drive. Just insert the CD/DVD or connect the USB/HDD drive to your (old) PC, add an (old) 3D graphics card, and an (old) TFT or monitor - and you've made the first step to your own cockpit home setup! 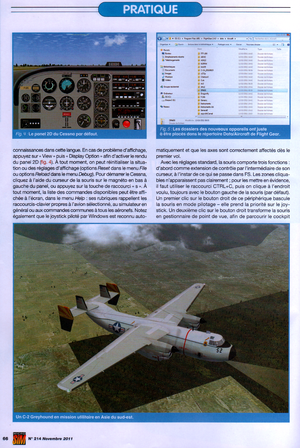 The PC boots the image, immediately starts FGPanel and displays C172p cockpit instruments. Run the FlightGear Simulator on your main PC and enable the C172 FGPanel Protocol to transmit data to your cockpit panel PC. The live CD is a freely available SUSE Studio project. It can also be cloned/modified/adapted to personal needs via SUSE Studio (web interface). Operating system is based on OpenSuSE Linux 12.1. FlightGear binaries (fgpanel) are directly pulled from the OpenSuSE build service (OBS). More information available at the SUSEStudio FGPanel project. Tristar Airlines (TSA) opened a new site to the public featuring phpVMS. We now give an even greater experience to FlightGear pilots. TSA flies to the Caribbean islands and surrounding places. Our hub at TNCC - Curacao Hato Airport modeled by Horacio (who also modeled RJGG) is one of the most beautiful projects in FlightGear. We fly a fleet of Embraer's and Cessna's. More info on the site. We hope to see you there! 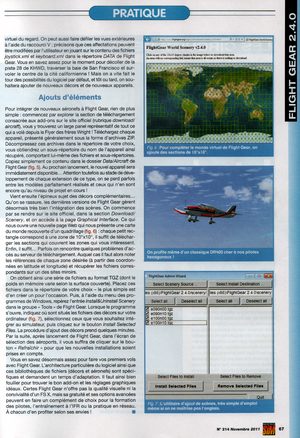 As promised in the previous edition, French magazine MicroSim published a tutorial for new Flightgear users. World's (and thus FlightGear's) largest Christmas tree. Do not forget to pay a visit to the Gerbrandytoren in the Netherlands. With a height of 366.8m and 120 lights, it is the world's largest Christmas tree between December 11 and January 6. 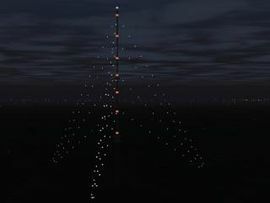 The tower is located 21 nm South East (HDG 120h) of Amsterdam Airport Schiphol (location on MPMap) and accurately modeled in FlightGear, including the Christmas decoration! This page was last modified on 12 March 2016, at 11:15.